1949: Objective Resolution passed by the Constituent Assembly of Pakistan. 1952: Proposal for the establishment of Islamic Research Institute presented in the Constituent Assembly by Chaudhry Muazzam Husain (Zahiruddin Lal Mian). 1956: Provision for the Institute laid down in the 1956 Constitution under article 197. 1958: The Organizing committee constituted by the Minister of Education, Government of Pakistan, resolved to establish the Institute. 1960: Statutory Notification No.F15-1056-E.IV issued for the establishment of the Institute. 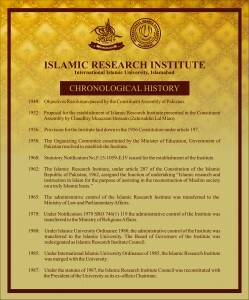 1962: The Islamic Research Institute, under article 207 of the Constitution of the Islamic Republic of Pakistan,1962, assigned the function of undertaking “Islamic research and instruction in Islam for the purpose of assisting in the reconstruction of Muslim society on a truly Islamic basis”. 1965: The administrative control of the Islamic Research Institute was transferred to the Ministry of law and parliamentary Affairs. 1979: Under Notification 1979 SRO 746(1) 119 the administrative control of the Institute was transferred to the Ministry of Religious Affairs. 1980: Under Islamic University Ordinance 1980, the administrative control of the Institute was transferred to the Islamic University. The Board of Governors of the Institute was redesignated as Islamic Research Institute council. 1985: Under international Islamic University Ordinance of 1985, the Islamic Research Institute was merged with the University and the IRI Council was constituted. 1987: Under the statutes of 1987, the Islamic Research Institute Council was reconstituted with President of the University as its ex-officio Chairman.